A portable headset that allows the recording of the electrical activity of a horse’s brain while unconstrained has been developed by French researchers. Hugo Cousillas and his colleagues from the University of Rennes 1 described their five-lead electroencephalograph (EEG) in a new paper published in the journal Frontiers in Veterinary Science. The device and its electrodes are able to be placed on a horse in less than five minutes. Electroencephalography is a diagnostic tool in human medicine that has been extensively studied for decades. It has a wide range of uses, particularly for evaluating brain alterations or dysfunction due to diseases or trauma. EEG readings are especially useful to characterize different levels of vigilance from the different stages of sleep to wakefulness. In humans, EEG recordings are mostly based on external electrodes placed on the head’s skin. The quality of human EEG recordings depends on the subject’s quietness, as levels of muscular activity may interfere. People must be quiet and avoid any movement. Obviously, these requirements present challenges in animals that limit its use. It is almost impossible to avoid movements in awake animals. Therefore, most EEG recordings in animals have been done invasively using deeply implanted electrodes or subdermal needles. Both may cause discomfort, as well as requiring anesthesia to implant the electrodes. Noninvasive methods have been used successfully, but the animals need to be kept immobile, generally in metal stocks. The electrodes are glued on the animal’s head and any movement has negative consequences. Cousillas and his fellow researchers described their novel EEG headset for horses, which they say solves all the key issues around taking such readings in animals. 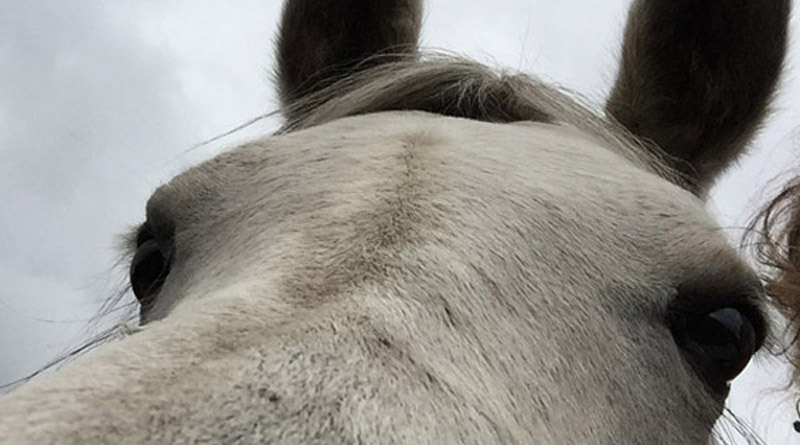 Their headset, adjustable for different head sizes, allows the easy placement of five electrodes on the horse’s forehead over the parietal and frontal bones. They said the design of the headset − a necklace made of large rubber bands − allowed good and stable electrode contact with the skin. They traversed the electrode positioning and the telemetric recording setup which enabled them to avoid the usual constraints related to cabling. The study team described the taking of EEG recordings from five horses at the French national equitation school of Saumur, in which each horse was quietly standing. The EEG recordings obtained were similar to those produced by other methods, they reported. Discussing their findings, they said the headset proved to be well adapted for recordings of freely moving animals in their home environment. They said the system developed can be used in the home environment, is easy and rapid to adapt to each horse, can be used on a freely moving animal, and does not put more constraint on the horses than the usual track. The study team comprised Cousillas, Martial Oger, Céline Rochais, Claire Pettoello, Mathilde Ménoret, Séverine Henry and Martine Hausberger.